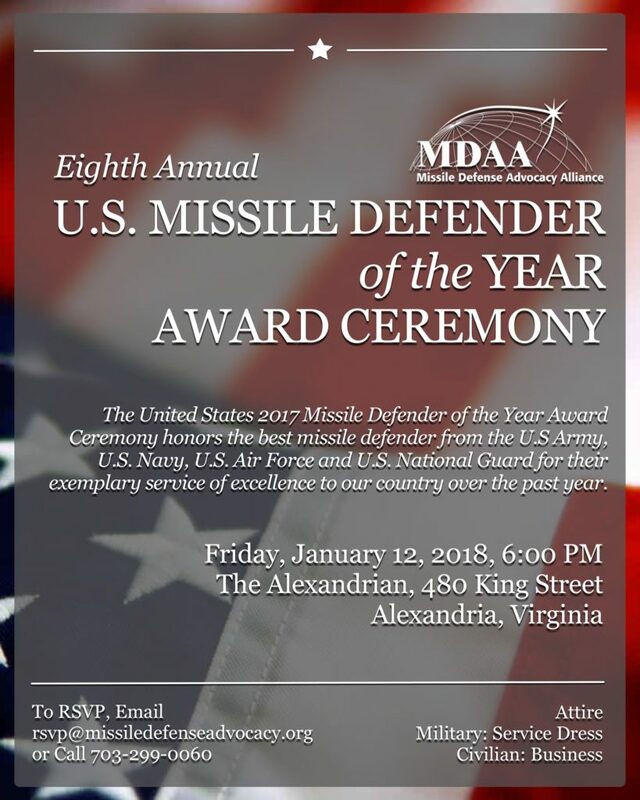 We are honored to invite you to our 8th annual Missile Defender of the Year award ceremony for the 2017 best Airman, Sailor, Soldier and National Guardsman for the United States of America in Alexandria. It has been an eventful, historic and tremendous year for missile defense in the world as our armed services and their missile defense capabilities have contributed to making the world safe and preventing conflict with nations that threaten the United States with missiles. Our National Missile Defender of the Year award ceremony now leads our eleven defender of the year award ceremonies in six countries: Germany, Netherlands, Japan, South Korea, UAE, and the U.S. which have collectively recognized missile defenders from 20 different allied nations. Winners associate with winners to win! We are honored to ask you, a winner, to associate with our nation’s winners in missile defense in Alexandria on January 12th, 2018. Spouses are invited to attend and dinner will be served. MDAA’s annual Missile Defender of the Year awards a United States Armed Forces member from each branch that is in command of a fully operational and deployed missile defense system. These select individuals represent the best in leadership and performance of their duties and demonstrate their commitment to excellence in the critical role of missile defense. They are an inspiration to their subordinates, peers and superiors.